I always wanted to be a mom; there was no doubt about that in my mind. However, motherhood changed me in many ways. I had dreams, expectations, and plans. Yet, none of those “worked out” the way I thought they would. I had planned on waiting until after college to have our first child. Yet, fertility fears, and surprises had us starting parenthood after only a year into our marriage. I had NOT planned on being a stay at home mom. Yet, the minute I looked at my firstborn, I knew I could not go back to work full-time. I had planned on being a public school teacher. Yet, God changed my heart, and I am now a homeschool teacher to three. I had planned on 4 kids, 3 years apart. Yet, I have three beautiful blessings, not spaced at all like I had planned! Motherhood changes us. It shapes us and it molds us. Motherhood has looked nothing like what I thought it would. It is messy, and scary, and beautiful. It is exhausting days and sleepless nights. It is unpredictable and exhilarating. It is wonderful, yet at times can still steal our joy as well. Motherhood also changes with each child. How you mother your first child often looks so different by the time you have your last. I wish I could go back and start motherhood over. There are so many things I would do differently. I would play more, and schedule less. I would worry less about what the world thought of me, and more about what I looked like through my children’s eyes. I would laugh at the spilled milk. And show how to clean it up. I would cuddle that colicky baby, instead of wishing the tears away. I would stop watching for the next season and embrace the one I am in. Yes, motherhood changes us. But it’s supposed to. I believe God created motherhood to break us, to shape us, and to mold us into what He wants us to be. Each season of motherhood is different, and each one opens our eyes to a whole new world. We learn what to expect and what not to do. We learn to embrace and hold on to things, instead of just wishing them away. We grow. We laugh. We change. Moms, let motherhood change you. Let it mold you. Let the changes happen naturally and don’t worry about the next season. Embrace where you are in your motherhood journey because, believe me, it will move fast enough on its own. 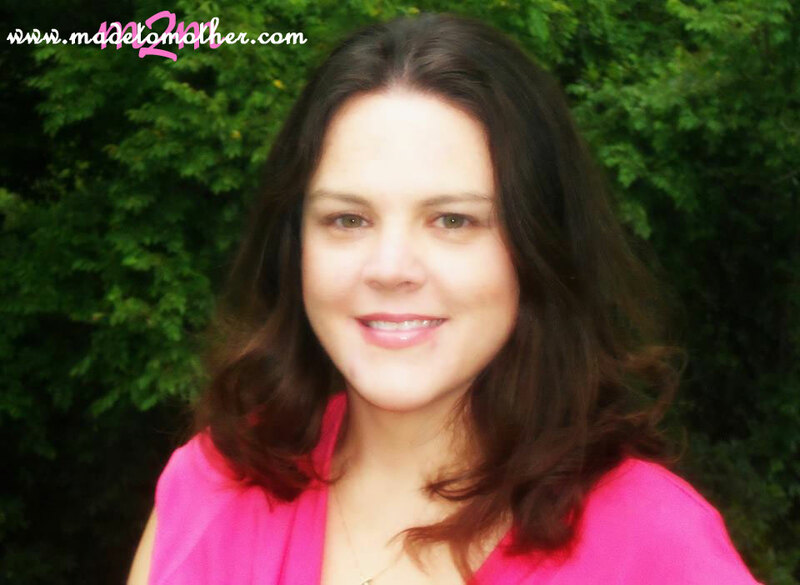 Misty Bailey is a Christian wife and homeschool mom. She resides with her family in Southern Ohio. She loves helping new homeschoolers and has a Homeschool 101 eBook for those getting started. She shares her struggles with time management, becoming unglued and finding joy in the everyday moments on her blog Joy in the Journey. You can also find her on Facebook and Pinterest. Thanks for letting me guest post. I really enjoyed it! Motherhood has made me a better mother because my sons taught me as much as I taught them along the way. My greatest blessing is being called “mom” by my two sons and every step of the journey has been amazing and believe me there have been a lot of steps with a 27 and 24 year old. Thank you for sharing today at The Weekend Brew. I, too, because a SAHM after Baby Boy was born. In my ideal mind this was to be the case, but I hadn’t shaped my life into doing that. At first, I struggled with having done so, but now I’m so filled with joy and gratitude that we have continued to make it work for nearly 2 years now. I look forward to many more years as well. I’ve learned to slow down sometimes, to not look ahead, to not worry about what’s ahead and to just be present. I’ve learned to be glad for the sleeping baby/toddler in my lap, as well as the rambunctious and busy, yet full of life sounds I hear all day. Yes, sometimes I think we learn more from motherhood then we could ever teach our children. Yes, messy, scary and beautiful. I have been surprised by motherhood and find no greater joy than being a wife and mom. And I never thought I wanted to have children, ha! I have 7. God has a plan for all of us and unfortunately we always end up following this somehow, even if we don’t realize it. Unless our plan aligns with God’s (which it rarely ever does), he will never follow “our” plan. I feel you on not having as many kids as you intended. My husband and I had two, I really wanted three but even had to push for number two. He’s happy that we did, but we both feel now that two is our magic number. I’m glad that my girls have each other, as I know what the bond of sisterhood can turn into as you grow. God has a plan for you, and it looks beautiful, I am still trying to find out exactly what is plan is for me! Thank you for catching me on that, I was replying at work going between a couple of things. I didn’t mean unfortunately we end up following his plan. What I meant to say was fortunately we always seem to follow his plan even when we don’t know it. Thank you Misty for sharing your awesome post with us here at “Tell Me a Story.” http://letmetelluastory.blogspot.com/ I had a long comment, but forgot to enter my e-mail and it got erased. 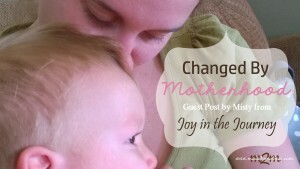 Yes Motherhood does change us hopefully for the better. God will forgive the times we make a mistake and turn it around to fit His plan. “I would stop watching for the next season and embrace the one I am in.” Oh yes. So much we can learn from living this truth, whether mothers or not. Thank you for all the beautiful words of wisdom shared from your journey and for joining us with Small Wonder. Isn’t it wonderful–even if a bit startling–to come to understand that God has a plan for us that may be entirely different from the one we had in mind for ourselves? I have definitely found this to be the case in my life. After years of struggling with infertility, we adopted two beautiful babies, then later were blessed to give birth to five more! I never expected to be the mother of seven, but I am so grateful that I am! Thank you, thank you, thank you for your post! Having recently had my fifth baby, and also being recently separated, starting a new job, a homeschool Mom and a full-time student, I needed to remember how important it was to remember the lessons that I’ve learned – especially about enjoying the moment with my babies. God bless you! Wow, tough season you are in, Letetia! Prayers for peace and strength and calmer waters soon. Bless you and thank you for visiting M2M today! Yes! I became a mom 9 months ago, and I was just thinking the other day how much I have changed during that time. I’m more flexible, give others the benefit of the doubt more, and have learned to slow down and not worry about the to-do list as much. One of the best words of advice I received at one of my showers was to enjoy each season instead of hoping for the next. I have really worked on that and it has helped me enjoy motherhood. Thank you for this encouragement! Great reminder! It’s almost become cliche to suggest that you actually enjoy motherhood as it unfolds, but really, all those older ladies in the grocery store are right: it DOES go by so fast and you DO eventually miss cleaning up after them when they leave! Thank you for sharing. We have lost our first two little ones before they were born. I hope when we do have one, that I can start off laughing at the spilled milk! Oh Nicole, prayers and hugs! I am so sorry for your loss. I looooooove Misty and I just adore this post. Play more and schedule less – YES! YES! YES! Isn’t it amazing how God fulfills our heart’s desires in ways we don’t expect? !